If you're old enough to understand the reference when I say my font collection rivals Imelda Marcos's shoe collection, you're probably delighted with the current Windows\Fonts folder. After all, in the pre-XP days, Adobe Type Manager (now obsolete) was a necessity even to install fonts; now with Windows XP, Vista, and 7, you simply drag-and-drop them to the right folder (with some fiddling in XP). So why would you need a font management system? For professional designers (and those of us who may have a little font-collection problem) software like FontExplorer X Pro is key to easily managing and organizing fonts both inside and outside the Windows\Fonts folder. Attaching labels, ratings, and comments to your fonts using FontExplorer is very easy. Learning how to search using these fields takes time and effort. On initial start up, FontExplorer gives you some great options for organizing your fonts. The default is no font organization; but you may also copy fonts to a FontExplorer folder, or move them. If you leave the software set to the default (not moving or copying fonts to a new unique folder) you can still manage them and may select to find either all active fonts or just the ones in Window\Fonts. It took less than thirty seconds for FontExplorer to scan and import my 1,000 plus fonts from Windows\Fonts. At first glance, FontExplorer may look like a list of all your fonts but it's much more versatile. You can sort fonts by family; create your own font sets; add labels, ratings, and comments; and even view WYSIWYG. There's a preview area that includes preset text, or write your own line of sample text to preview. Unfortunately this only extends to one line, there's no option for creating an extensive sample, but if you need more information on a font, FontExplorer provides detail on characters and kerning pairs in the Information popup. 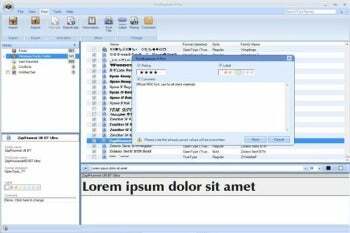 FontExplorer will allow you to easily group your fonts, and you can relatively easily create very complex filter criteria to sort different Names, Family, Format, and Style. If you are a beginner, expect to do your homework here, since there's no drop down menu for format and style types, and the filter options can be confusing. Unlike similar Printer's Apprentice ($29), which uninstalls or deletes unwanted fonts, FontExplorer deactivates fonts using a check box system, which means you can deactivate an entire group at once. FontExplorer also won't let you deactivate fonts that are used by your system (they are displayed with a padlock symbol next to them and a grayed-out checkbox). There are a few annoyances with FontExpert: Use Custom setup if you don't want to install Apple's Bonjour. Also, the buttons are few, but I really wish FontExplorer included hover labels. For example, you can change the color of your sample text and the background color of your highlighted text, but the buttons look the same and there's nothing to tell you (other than trial and error) which is which. The biggest problem I had with FontExplorer, however, was reading some of the text. For example, in the Information popup, the Summary headings are all displayed in pale gray, and are very hard to read; and although the color labels are customizable, the defaults are so faint I thought they were grayed-out and unavailable to use. Like any database management system, FontExplorer is only as effective as the information you give it, but there are many different options for that information, and that makes FontExplorer infinitely useful, whether you're a professional designer, typographer, or font-lover. Plus FontExplorer is super efficient at activating and deactivating fonts, so you'll never lose your client's favorite font again. Find, sort, label, and organize your fonts--plus disable unused ones--with FontExplorer X Pro.